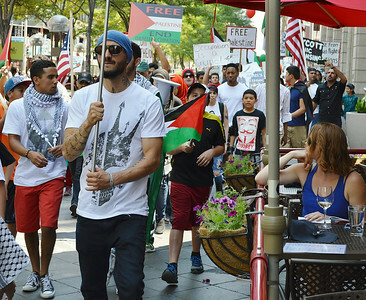 Palestinians and supporters rallied at the State Capitol, then marched through downtown Denver, Colorado to protest Israeli attacks on Gaza. 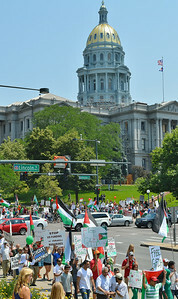 Large group of protesters marching on sidewalk carrying signs and Palestinian flags, other marchers crossing street in background, Colorado state capitol dome at top of image. 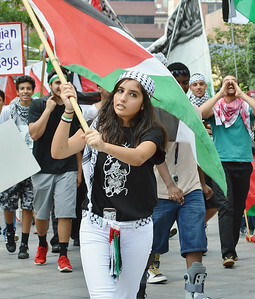 Woman holding large Palestinian flag on a pole. 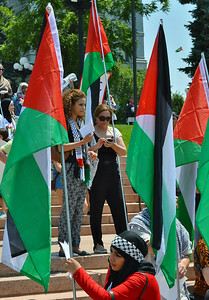 Two women surrounded by large Palestinian flags, one looking at cellphone, another woman in foreground wearing Hijab, looking at papers. 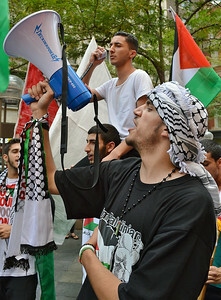 Man wearing keffiyeh on head shouts while holding bullhorn, in background, other man up on another mans shoulders, holds microphone, Palestinian flag in background. 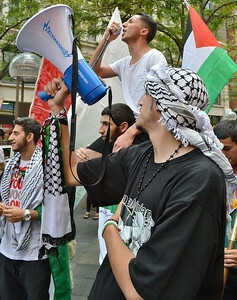 Man on top of anothers shoulders, speaks using bullhorn being held by other protester wearing keffiyeh on head, Palestinian flag in background. Young woman waves palestinian flag on pole, other protesters with signs, one shouting, march behind her. 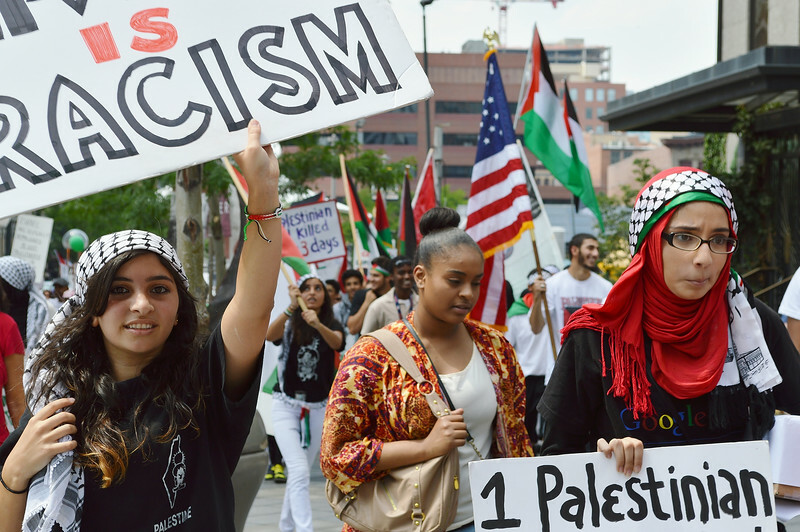 Young women march in Palestinian protest, one wears hijab other wearing keffiyeh on head and carries sign about racism, other marchers in background with American flag and Palestinian flags. 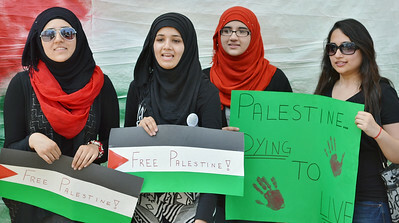 Group of young women holding signs about Palestine, three wearing hijabs. 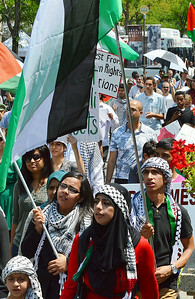 Two women wearing black hijabs and carrying Palestinian flag signs, one shouting, other demonstrators in background. 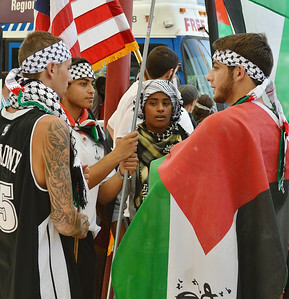 Group of young men at protest, one wearing Palestinian flag draped across shoulders, other wearing keffiyehs, American flag in background. 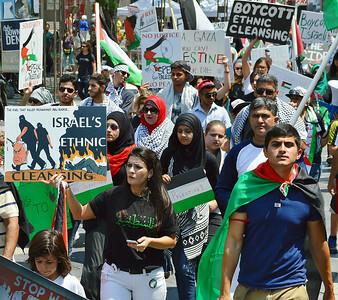 Young woman wearing green hijab turns to camera, behind her , man wearing keffiyeh on head holds up sign about Israel boycott. 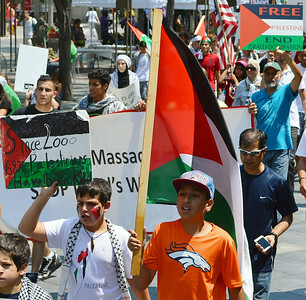 Young boy wearing Denver Bronco t-shirt and Colorado Avalanche hat, carries Palestinian flag, other demonstrators behind him with signs and flags. 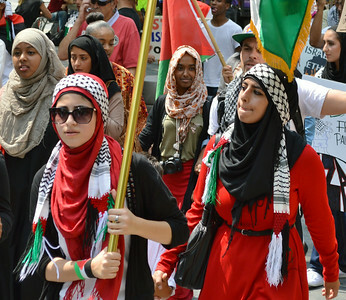 Two young Muslim women wearing hijabs and Palestinian scarves, other marchers behind them. 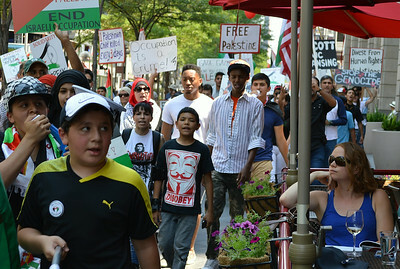 Woman in red wearing hijab, demonstrators march behind her carring signs, young man wearing keffiyeh looks up at large Palestinian flag he is carrying. 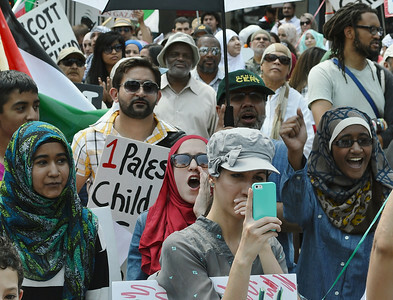 Group of marchers at Palestinian protest, many with signs, some women wearing hijabs. 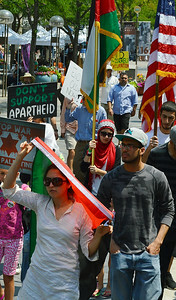 Young woman marching with Palestinian flag draped over her head, other demonstrators behind her, one carries Palestinian flag, another the American flag, another a sign with Star of David on it. 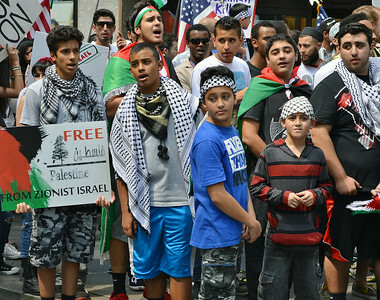 Group of young men and boys at protest, some wearing keffiyehs, some hold signs, one wears Palestinian flag draped across shoulders. 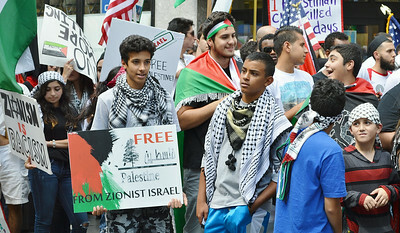 Young man looks up at Palestinian flag he is carrying, woman wearing hijab in front of him, protesters with signs behind him, tall office building in background. 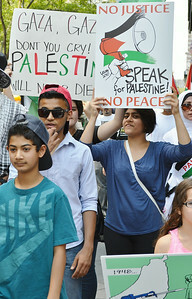 Man wearing black beret and bandana on face, woman next to him raises sign about ethnic cleansing above head. 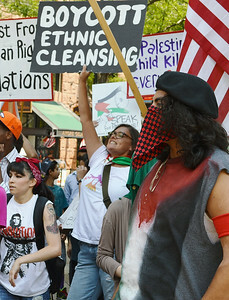 Man wearing black beret and bandana on face, woman with tatoo on arm wearing Che Guevara t-shirt, woman between them raises sign about ethnic cleansing above head. 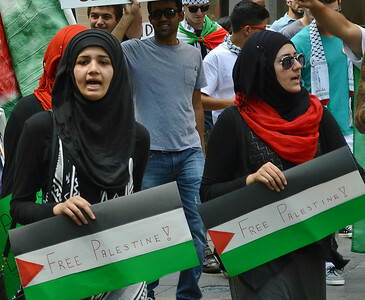 Young woman marching with sign about Palestine, other protesters around her. 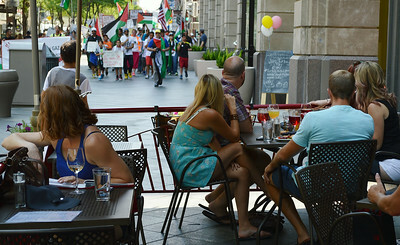 Group of people seated outdoors at restaurant, turning to look at protest march coming towards them, demonstrators carrying signs and Palestinian flags. People seated in outdoor dining area turn to look at protesters with signs about Palestine marching by. 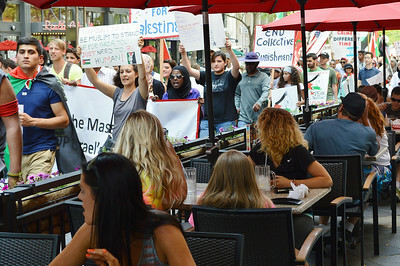 Young woman seated outdoors at restaurant turns to watch Palestinian protest march go by, demonstrators carry signs and flags. 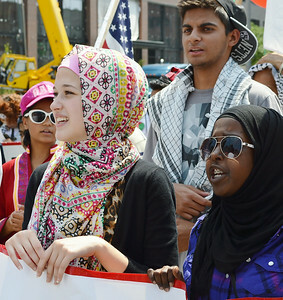 Young woman looking at cellphone, behind her two women wearing hijabs shout, other protesters in background. 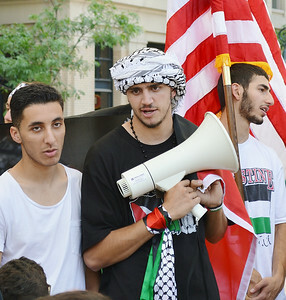 Young man wearing keffiyeh on head, holding bullhorn and Palestinian flag, two other young men next to him, one holds American flag. 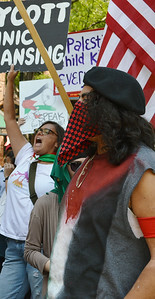 Two young Muslim women wearing hijabs at protest, shouting. 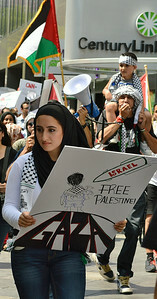 Young woman wearing black hijab, carrying sign about Palestine, in background man carrying young boy on his shoulders speaks through bullhorn, both wearing keffiyehs, Palestinian flag in background. 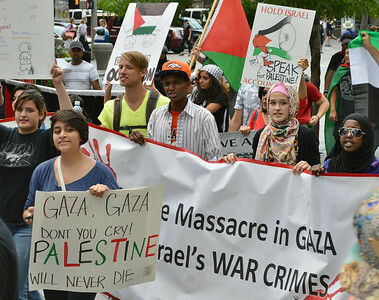 Young men and women marching with banner about Gaza and Israel, two women wear hijabs, one African-American man wearing Denver Bronco hat, other protesters around them with signs and Palestinian flags. 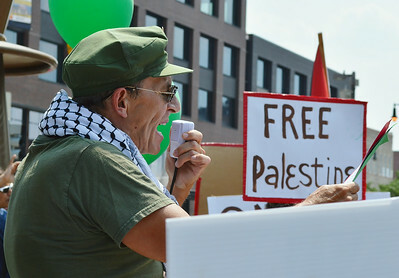 Man wearing keffiyeh speaking into microphone, free Palestine sign in background. Group of young girls and two ypoung men posing for picture in front of large Palestinian flag, women in foreground takes picture with cellphone. Line of young Muslim women wearing hijabs, kneeling in prayer. Line of Muslim men bowing to pray, some wearing keffiyehs, Palestinian flags on ground in front of them. 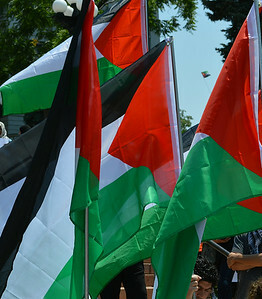 Group of large Palestinian flags displayed on poles. 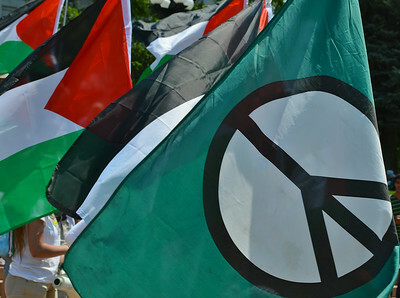 Large peace sign flag with Palestinian flags behind it. 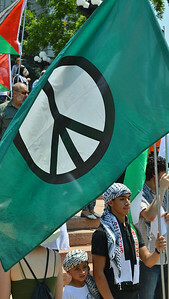 Young man holding large peace sign flag on pole, young boy stands next to him, both wearing keffiyehs on their heads.